A logo for the 150th anniversary plays homage to the team's original name, and one of its former stadiums. The Reds started as the Red Stockings, who went undefeated in their 57-game inaugural season. That original name is recognized in a logo that will be around Great American Ball Park, and on team activities and giveaways. Players' uniforms will have special patch featuring the logo and a variant for home and away jerseys. The logo also includes elements of the former Reds stadium, the Palace of the Fans, where the Red Stockings played from 1902 to 1911. Chief Operating Officer Phil Castellini says the team is bringing back a lot of looks from the past. "We have selected 15 different iconic uniforms that cover the entirety of Reds' history. We're going to use one of those every weekend starting May 4. It is the first date that the first game in 1869 was played," he says. Castellini says there will be a lot happening off the field too. The Reds will install 20 benches around the area with statues of the Mr. Redlegs mascot wearing different throwback uniforms. The team already announced plans to revamp the Reds Hall of Fame and Museum in time for the 2019 season. On July 5, Great American Ball Park will host an open house, with current and former players making appearances, and a Rozzi's firework show. The Reds plan to take down the fencing along Joe Nuxhall Way to open the pavilion up to fans. 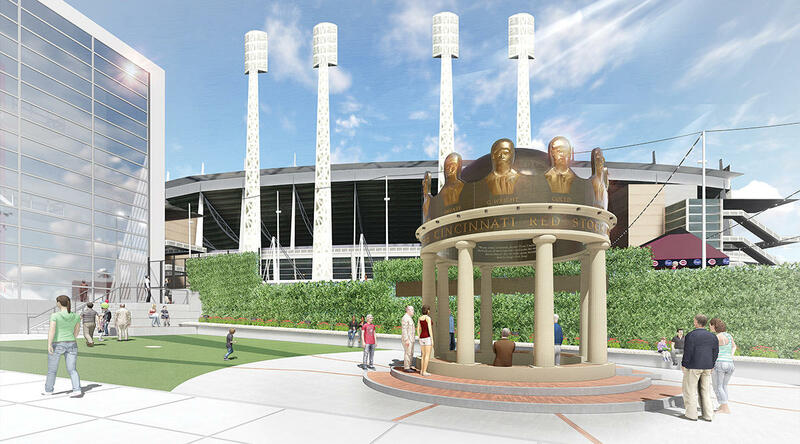 Outside the stadium, Castellini says the team will build a special pavilion with a gazebo in the rose garden outside the Hall of Fame. "It represents the crown of the Queen City and around that crown is the starting nine players of the 1869 Red Stockings. We will take down the fence and open this pavilion up to all fans all the time." Castellini says the Reds Community Fund will renovate two fields in 2019: Ross Park in St. Bernard and the Bellevue Vets complex, in Bellevue, Ky. Both will be designed to be an homage to the Palace of the Fans. 2019 also marks the 100th anniversary of the Findlay Market Opening Day parade. Organizers have said they also plan to recognize the anniversaries. New Reds Manager: "We're Moving Home"
Cincinnati native David Bell met with the media Monday, a day after he was announced as the Cincinnati Reds' new manager, thanking his family for their support. "Thanks for being willing to move again," he said. "This time, we're moving home."